Skip the usual hangout spots, add a dash of excitement to your day and head out for a day of fun and masti with a trip to Mastiii Trampoline Park! 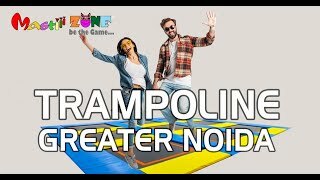 set within the Grand Venice Mall, Greater Noida inside Mastiii Zone, the Mastiii Trampoline Parks is one of the largest trampoline park in India. The Park features top-notch equipment and is managed by an efficient staff. Offering entertainment option for people of all ages the Trampoline Park ensures a day of excitement with each visit. Jump, hop and trampoline your way to lifelong memories with a trip to Mastiii Trampoline Park.